We all know that quality gear can make your life much easier. The best spinning rods for bass are no exception and better your chances of success. Bass are one of my favorite fish to catch. Not only are they incredibly aggressive, but they put up one hell of a fight, making sure you work for the catch. It’s never straightforward successfully landing one these fish, which is why they have bass fishing has established itself as popular fish species. Regardless if you’re already an established bass enthusiast or your just looking to dip your toes into this exciting sport, we’ve put together a list of the best spinning rods for bass for a range of expertise and budgets. We hope this article helps you find the info you’ve been searching for, but please let us know in comments below if we’ve missed anything. What Makes The UglyStik GX2 A Good Spinning Rod? What Makes The Perigee II A Good Spinning Rod? What Makes The Triumph A Good Spinning Rod? 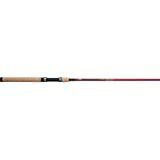 What Makes The Cherrywood HD A Good Spinning Rod? What Makes The PLUSINNO A Good Spinning Rod? What Makes The Vengeance A Good Spinning Rod? What Makes The SE Teramar A Good Spinning Rod? 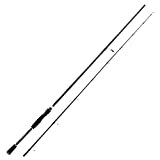 What Makes The Stimula A Good Spinning Rod? What Makes The Champion A Good Spinning Rod? What Makes The Sping Jig A Good Spinning Rod? The GX2 UglyStik G2 Spinning Rod has long been a fan favorite, and for good reason. The rod has been made using a composite of fiberglass and graphite. In practical terms, this means the spinning rod is durable, strong, and light enough to provide excellent feedback and sensitivity. Finishing of the rod is a very comfortable handle made from EVA. I liked the fact that the rod is not overly stiff, is easy to cast and is sensitive enough to be able to detect even the smallest bit of action. The rod was designed to take 8-20 line and is suitable for nearly every environment, from freshwater lakes and rivers, through to saltwater. I found it comfortable in the hand and light enough so that the weight wasn’t a distraction. I feel it offers a great balance between cost, usability, and functionality. 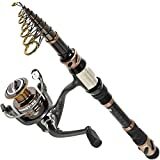 In my opinion, this spinning rod provides excellent value for money and would be the best choice for those starting out with bass fishing or those who only fish occasionally. If portability is a priority for you, then the GX2 is available in both four piece and two piece configurations. The four-piece is small enough to fit inside an average backpack, so there’s no excuse for not taking it with you. Even though the name of the spinning rod would suggest otherwise (UglyStick), the design is pretty nice. It’s modern, minimalistic and sleek, as far as rods go, it’s pretty good looking. KastKing has long been a favorite amongst anglers, its cemented a reputation for creating excellent products. The Perigee II spinning rods are no exception and are available in 1 piece and 2 piece options. I’ve found the rods to be a cut above the competition and made to very fine tolerances from KastKings proprietary manufacturing process. These spinning rods have been constructed from a carbon matrix which results in a pole that is lightweight, easy to use and strong. We would fully expect these rods to last decades of use. Not only is the rod well made, but the components that make up the rest of the pole are also very high quality. The ring line guides are made Fuji and are considered one of the best in the industry. Ensuring the rod remains comfortable is the EVA handle, and keeping the reel in place is a graphite reel seat. This is well put together piece of kit. The Perigee II spinning rods are easy to control and are sensitive enough for most applications. Unlike many other brands, the two-piece rod is equal to the one piece in terms of performance, with the added bonus of being easier to transport. KastKing has made these spinning rods available in a range of powers, lengths, and actions to ensure you can find the perfect fit. In order to maximize strength, weight, while still maintaining sensitivity, the Triumph has been crafted from graphite. In addition to the poles durable construction, the rod features a comfortable highly durable cork handle, robust corrosion resistant real seat and high-quality corrosion resistant line guides. The spinning rod has been designed to comfortably handle lures rated between 0.1 and 1.1 oz. 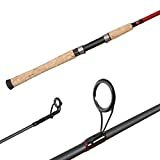 I found the rod to be light enough to detect even the smallest of bites, yet at no time did I feel the rod was flimsy and not capable of handling larger fish. I especially appreciated the ratio between the handle length and rod length, which provided plenty of leverage as well as a comfortable casting position. The line guide positioning ensured the line traveled with very little friction, which allowed for maximum casting distance and accuracy. Even after extended use the cork handles remained comfortable and I always felt in control of what the rod was doing. Berkley is an established brand with a well-respected reputation. 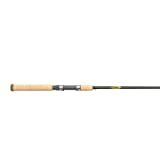 So, it comes as no surprise that the Berkley Cherrywood HD Spinning Rod is one of the best available. A quality build, well-balanced sensitivity and an action that is a joy to use, this really is a fantastic spinning rod. Whether you’re an experienced angler, or just looking to start out, you’ll find something to love about this spinning rod. I found the hybrid design to be well executed, allowing for both strength and sensitivity. I especially enjoyed the cork covered handle, reminding me of the rods I used as a child inherited from various relatives. 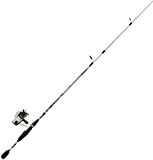 This Berkley rod is capable of casting with a fair degree of accuracy and sturdy enough to wrestle a catch out of cover. We found it perfectly capable of accommodating a range of reels, and perfectly suited for any number of baits. From livebait through to jigs, all worked well. If you’re looking for a rod that you can use in both freshwater and saltwater conditions, then this spinning rod has those points covered. While most rods will sacrifice either weight or strength, the Cherrywood HD has managed to balance these two qualities exceedingly well. It’s top tier construction, superior materials and price to performance rating mean it’s very easy to recommend to both experienced and beginner anglers alike. You’re going to get excellent value for money, I wouldn’t hesitate in recommending it.  Full Kit with Carrier Case is special made for novice, including nessary accessories for fishing. You can use it without buying any other accessories from anywhere. The PLUSINNO Fishing Rod and Reel Combo may be cheap and cheerful, but that doesn’t mean it’s a bad rod and reel combo. I fully expect to be ridiculed by Bass fishing elitists for recommending this combo, but the truth of the matter is, not everyone wants to spend hundreds of dollars on a rod and reel. If you want a cheap option that will quite literally fit into a small backpack, then you can’t go wrong with the PLUSINNO. It’s not a rod I would take away with me on a dedicated fishing trip, but if I’m away for the weekend with the kids and want something I can throw into a bag and forget about, then you really can’t go wrong with it. The rod offers reasonably strength, durability and flexibility, and there’s no reason why you wouldn’t be able to catch plenty of fish with it. It’s the sort of rod I would have loved to have had as an eight-year-old, with its telescopic design and ease of transporting. If you buy this spinning combo and expect the world, then you might be disappointed. But if it’s something you buy so you can dip your toes into the world of Bass fishing without spending a ton of money, then there’s a lot to like. It’s easy enough to set up and casting is reasonably accurate, but above that, it’s fun and I don’t stress about leaving propped up on the bank of a lake. This spinning rod made by Abu Garcia is surprisingly decent and more than capable of providing hours of fishing fun. The rod has been constructed from modulus graphite, which might just be marketing hype, but it seems to be flexible and strong. Coupled with the steel line guides and comfortable EVA handle, it makes for a capable Bass rod. If you’re looking to buy one then you’ll have a range of lengths to choose from, as well as medium to heavy. I found the rod to be sensitive to small plays in the bait, so detecting a bite should be easy enough. The casting was comfortable and accurate and at no time was I concerned about the durability. The handle provided plenty of support and I had no complaints about the grip or hand position even after a couple of hours. If you’re looking for a high-quality spinning rod that offers a sensitive tip yet remains relatively stiff, then the Vengeance should be near the top of your list. I had no troubles using both light and heavy lures, remaining in control at all times. I would see no reason why you couldn’t use this rod for both freshwater and saltwater environments. Coming in at a respectable 7 feet in length, the SE Teramar boasts a high strength graphite design. Ensuring it remains lightweight, strong yet still able to detect bites. The line guides are made from high-quality steel and the rust-resistant real seat has been coupled with a screw down setting to ensure the reel remains in place. Keeping things comfortable is the cork handles. This rod is slightly lighter than most of the rods we’ve already featured, making it better placed for smaller lures and lighter lines. However, we’ve seen it wrestle fish out of deep cover, so it should possess ample enough strength to free even the most embedded fish. The rod is very sensitive to play of the lure and line, so detecting a bite should be seamless. A good Bass spinning rod should be sensitive, strong and accurate, and the SE Teramar ticks all of those boxes and more. I found its characteristics to be closer to premium rods, but an undeniably affordable price. If you want an all-rounder that can be used across a range of fishing environments, then the SE Teramar should be at the top of your wish list. Shimano has a long and prestigious reputation, they’re well known for there durable and quality products. The Shimano Stimula is no exception to this design ethos. Packaged with aluminum oxide line guides, a screw down reel seat and genuine cork handle, the rod offers excellent value. It’s available in a range of lengths, from a diminutive 5 feet through to 6 and in range of powers from light to medium. Our testing shows that it’s sensitive, incredibly accurate and sturdy enough to power through most conditions. Over a long period of use, the rod remains comfortable and we’d have no problems using it as our daily rod. Even without the reputation of the Shimano brand, I’d have no problems recommending the spinning rod to anyone looking for something with an exceptional price to performance rating. No matter if you’re using topwater frogs or crank baits, this rod will handle them all with ease and should have no problems with most freshwater species. Dobyns may not be cheapest rods available on the market today, but there’s a reason for their price. Simply put, they are outstanding rods that are a step up or even several steps up from some of the rods we’ve already featured. If you’re serious about Bass fishing and would like to invest in a rod that is unlikely to ever need an upgrade, then the Dobyns Champion should be right at the top of your shopping list. The rod boasts a very soft tip, allowing for both incredible cast accuracy, but it also allows for baits to be presented in a very subtle and lifelike manner. Don’t think that the soft tip makes the rod weak, because it doesn’t. When you need the power and strength to direct a fish away from cover, then you can do that with ease. With a little bit of practice, you’ll have your bait playing through the water in a fashion you never thought possible, and its all due to the excellent rod design. This is one of the most highly rated spinning rods available on the market today and should mean your fishing experience is that much more refined. From monster bass, through to Crappie, everything is can be caught with these rods. I wouldn’t necessarily recommend using them for saltwater, you’d be better of buying a saltwater appropriate rod. The Spin Jig rods from G.Loomis are incredible and need to be felt to be believed. When you have one in your hand, it almost feels like there’s nothing there, they are that light. A small flick of the risk and you’ll find your bait soaring through the sky with uncanny accuracy, they are by far one of my favorite rods. Both my son and I use them, he’s under 10 at the time of writing this, but he’s able to pull of some amazing casts. Additionally, after a day of use, there are no complaints about the weight or comfort of the rod, they’re brilliant. The Sping Jig offers a ton of sensitivity, allowing you to feel everything that is going on with the bait. But they also have a ton of backbone and will pull through nearly anything. If you’re looking to buy something that costs a bit more than your standard Shimano, then the G.Loomis Spin Jig is a great choice. Even better, you can use them for a range of fishing methods, from live bait through to crankbaits, from Bass to Salmon. Like the Dobyns, I wouldn’t use them on saltwater if I had other rods available, but they’re fair game for anything freshwater-related. The list we’ve pulled together above is quite subjective, we’ve done what we can to cover off something to suite all skill levels, budgets, and requirements. However, there is no magic spinning rod that will suite everyone. This is one of the reasons that each model will have many options to choose from. The question still remains, should you get a medium or heavy, light or quick action? Is a one-piece spinning rod better than two or four pieces? What’s the best length to get? It’s easy to feel overwhelmed with the range of options out there, and you’ll probably end up second guessing yourself more than a few times. Not only do you need to worry about the brands and sizes, but there’s also a ton of technical jargon thrown in which can sound confusing as well as impressive. That’s why we’ve written this article, we wanted to make the process of buying the best spinning rod for bass as seamless as possible. In the rest of the article, we’ll go over all the important parts that make up a spinning rod, how they affect the rod performance and offer some tips and advice on what to look for and how to match it to your fishing style and preference. The handle is an often ignored or underappreciated component of a spinning rod. After all, you’re going to be holding the rod for what could be hours at a time, through hot, wet, cold or dry weather, so it needs to remain comfortable and you need to be confident that you can maintain a good grip. For these reasons we recommend paying close attention to what the rod handle is made from. In today’s market, there are three handle materials you’re likely to come across, cork, EVA and wood. These offer plenty of grip in most weather conditions and they also transmit movement directly to your hands, which makes it easier to detect a bit or the lures movements. EVA is one of the most comfortable materials and will offer a comfortable and confident grip no matter the conditions. The only downside is that they may not be as durable as the other options, but they’re also easier to replace if it comes to that. Wood will give a rod a classic look, but the grip is not especially good, particularly in wet or cold conditions. A well treated wooden handle should last a very long time, certainly more than cork, but it wouldn’t be my first choice. The rod action is basically how flexible or stiff the rod is. If you attach a weight to the end of your rod, how far down from the tip the apex of the bend describes the action. To confuse the matter further, there is no standard measurement between manufacturers. One manufacturer might describe a rod as having a slow action, which would be described by another manufacturer as being light. However, we’ve done what we can to describe these actions in general terms below. An extra fast action is a rod with the least amount of flex, most of the ben will take place at the tip with very little being transmitted through the rest of the rod length. They’re especially suited to fighting larger fish, or when the cover in the surrounding area is especially heavy. If you’re fishing near docks or in water with heavy vegetation, then an extra fast action is ideal. The tip action will also help pressure any bass you end up hooking. These rods will flex more than extra fast, with the apex of the flex occurring closer to the center of the rod length. In my opinion, they offer a good balance between flexibility and power and more often than not this is what you’re looking for in a bass spinning rod. They work especially well with a jerk baits, spinner baits, and topwater baits. It probably comes as no surprise, but these rods are more flexible than both extra fast and fast action rods. They are best suited for situations where a light delicate approach is best and can make casting easier as well as incredibly accurate. Lastly, slow action rods offer the most amount of flexibility and the bend will take place through the complete length of the rod. If you’re looking to catch small fish with delicate lures, then a slow action rod is an obvious choice. The power of a rod is basically its strength and the amount of weight required to bend or load it, it often referred to as the backbone. In a nutshell, it’s how easy or difficult it is to bend the rod. You’re likely to see ultra-light, light, medium, medium-heavy or heavy rod ratings. A rod rated has heavy will require the greatest amount of weight or effort to bend it and are typically the least flexible. Like extra fast action, they’re best suited for larger fish, heavy over or fish with a lot of fight. As you go down the power rating, the effort required to bend the rod will reduce. The power rating of a rod will also influence the heaviness of the gear you can use. A heavier rod is best paired with a stronger line and heavier lure. As the power reduced, the lighter the line and lighter the lure you can use. The ideal fishing rod should be sensitive enough to accurately transmit vibrations and movement to your hand. We also want to be confident that the rod won’t break under pressure but should also be flexible. Modern day spinning rods are typically made from fiberglass or graphite, or in some cases, a hybrid of these materials. Both of these materials offer lightweight designs that will remain comfortable throughout the day. Additionally, they transmit vibrations will. If you receive a bite, you’ll feel it. So even if you’re up against shy fish, you should be in with a chance of setting the hook. Graphite is typically the lighter of the two options and provides better performance overall. There is, of course, a downside to graphite rods. An inexperienced or overly anxious angler may be tempted to attempt to set a hook to soo based on a tentative feel of the bait. In years past, a graphite spinning rod would have cost a small fortune, but thankfully that’s no longer the case and they are becoming increasingly affordable, yet still cost more than carbon fiber. Fiberglass is the cheaper of two popular options available today. They’ll typically weigh slightly more than an equivelant graphite rod, but the gap between the two is always narrowing. Fiberglass spinning rods are strong and can take a lot of punishment, however, they don’t offer the same sensitivity as graphite. I especially like fiberglass rods as an all rounder, suitable for both freshwater and saltware as well as a range of lures. While they are not as sensitive, with practice they are just as effective as graphite. They also tend to flex over the whole length of the rod and are great when you know you’re going up against aggressive or larger fish. Composite rods are made to bridge the gap between the two extremes of graphite and fiberglass, taking the best of both with fewer downsides. The perfect composite rod will boast the lightweight nature of graphite with the strength and toughness of fiberglass. They make fantastic spinning rods that allow for a lot of play in the lures and will let you feel exactly what’s happening with your bait of choice as it travels through the water. If you’re looking for a bass rod, you’ll probably either buy a spinning rod or a baitcasting. The differences can be subtle, but which is best baitcasting or spinning rods? The defining feature of a spinning rod is that the reel and line guides are located on what we’d refer to as the underside of the rod. With a spinning reel, the line tends to spool off at varying angles and positions. In order to accomodate this randomness, the line guides tend to be on the larger side when compared to a casting rod. In most circumstances, spinning rods and reel are better suited to slightly lighter setups. So a lighter line in conjuntion with a ligher lure, fishing for a lighter fish. I wouldn’t take this to seriously though, as you can still catch very large fish with a spinning rod and reel. Where a spinning rod really wins out is that they’re great for targeting hard to reach areas such as under cover. If you’re just starting out, then you’ll probably find a spinning rod much easier to master. Many specialist techniques require a spinning rod to accomplish. So, if you’re looking to work the top water or use a shaky head, then a spinning rod is the best and easiest option. Casting rods position the reel and line guides on the opposite side compared to spinning rods, i.e. on the top. The line guides will be larger at the reel end and gradually taper down in size as they reach the end of the rod. The biggest advantage of the casting rod is that you have more control once you have a fish on the line. Most casting rods will take heavier gear, larger lures, and lines and are most often better suited to tackling bigger fish. If you’re looking to tackle bigger and more aggresive fish, then a casting rod if the obvious choice. It should be noted that baitcasting rods are often harder to use, so are not recommended to anyone new to the hobby. When you’re just starting out you already have a lot to think about, so adding additional complexities are undesirable. At the end of the day, you can catch Bass and many other fish species with both spinning rods and baitcasting rods. The functionality between the two is marginal for most 90% of anglers, so don’t let it sway your decision-making process too much. It should come as no surprise, but the length refers to the length of the spinning rod. Most bass spinning rods will average between six and eight feet. A short rod would be classified as anything in the range of six and seven feet, and a long rod will typically be seven feet or more. As a general rule of thumb, the longer the rod, the further you can cast, but you’ll sacrifice accuracy to do so. A shorter rod will be more accurate for most anglers. When you’re deciding on a rod length, you’ll want to think about where you’ll be doing most of your fishing, are there lots of trees and overhead obstacles? How far are you looking to cast, or is accuracy more important? If you’re fishing in a small body of water or if there are lots of overhanging branches, then a shorter rod is probably the sensible option. If you’re fishing in a large body of water and you absolutely must cast into the horizon, then a longer rod makes sense. If you ever want to fish off something, be it a boat, kayak or dock, then a shorter rod is better. For fishing from the shore or when you’re level with the water, then longer rods make more sense. A shorter rod is also easier to transport and better suited to a ligher set up and smaller fish. Bigger fish tend to need a bigger rod, the exception to this is if you’re fishing from a boat or kayak. When we’re looking at rods, we want as little friction between the line and rod as possible. Rod line guides are the biggest contributing factor to friction, so we want to get the best possible ones within our budget. Titanium or ceramic guides are considered the top tier option, offering a frictionless experience as you can get. Any snags, rough edges or unfinished line guides can spell disaster for your fishing experience. Either causing line failure or drastically reducing your ability to cast any distance. An excellent spinning rod can improve your fishing experience, there’s no doubt about it. The best bass spinning rods will make the experience more fun, increase the chances of a catch and last a lifetime of use. Even at the best of times, detecting a catch can be challenging, so tipping the odds in your favor makes sense. Weighing up what characteristics matter the most to you is an important part of this process, so take the time to go over this article before making your decision. If you appreciate what you’ve read, clicking on any of the links above before you make your purchase will give us a small commission, but if you don’t want to, we completely understand. If you’ve picked one of the rods we’ve recommended, then we’d love to hear about your experiences, good or bad. And as always, if you feel we’ve missed something, or that we’ve made horrible choices, let us know in the comments below and we’ll get back to you. We hope you have a great time fishing over the next few months and please do visit us again if you’re looking for any more information or tips.